Why are the battery cables important? Your car’s battery cables have an important job. Their role is to transfer electricity from the battery to the starter motor and alternator. This allows your car to start and stay running while keeping the battery constantly charged. Car batteries have two cables; a negative and positive cable. 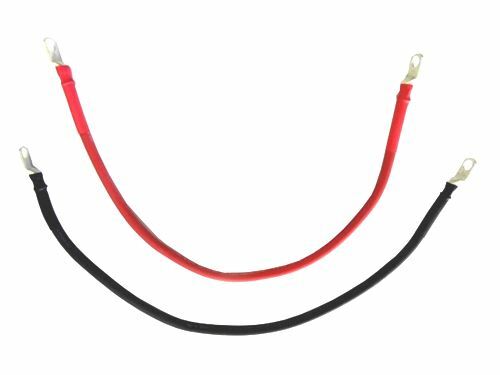 The positive cable usually connects to your starter motor, which helps your engine to crank upon starting the engine. The negative battery cable is bolted directly to the body of the car (chassis) and engine block. This allows for a constant flow of electricity through the battery to the car’s various electrical components and accessories. When should your car’s battery cables be replaced? In most cases, battery cables will last for at least 150,000 km. However, they won’t need to be replaced until they start showing signs of wear. Since battery cables are constantly in use, wear can occur. This usually happens due to corrosion, over heating or the insulation perishing. When a battery cable becomes damaged, it will need to be replaced rather than repaired. A battery cable replacement is usually straightforward, and can completely restore power to your battery and electrical accessories. Visible damage to the cables – Upon examining the cables, you may notice visible signs of corrosion or severed connections. The worse state the cables are in, the harder it is for them to transfer electricity. You may also see damage to the insulation of the battery cable from heat, cuts or cracks or from the insulation perishing. Car not starting – When you turn your keys, you may hear a clicking noise followed by no ignition. This can be caused by a weak connection between the battery and battery cables. No accessory power – Electrical accessories are parts of your car that are powered by the battery, such as the stereo, speakers and lighting. Damaged battery cables can prevent electricity from reaching these components, resulting in them not working at all. Problems with battery cables and wiring can cause similar symptoms to a bad car battery. This often prompts people to replace the battery and wasting their money. When you have your battery and charging system examined by a professional, they will be able to quickly determine whether the problem is caused by the cables, battery or other components such as the alternator or starter motor. At Grimmer Motors, our team of experienced mechanics can examine your charging system for you and replace the battery cables. This will allow for your car to start correctly. For car battery cable replacement in Hamilton, contact Grimmer Motors today!